In the wake of the shootings in Dallas that claimed the lives of five police officers, members of the NW Dallas County APA rallied together in support of the fallen officers to bring their community closer together. They held an 8-Ball Scotch Doubles Police Benefit and Tournament on Aug. 7, 2016 at Wizard’s Sports Cafe. Fifteen 8-Ball Doubles teams from the Dallas area converged with their support to help make this a successful event. “We had donations from our APA vendors, Host Locations and local businesses for the silent auction, as well as the support of our players in showing up to play in the event,” NW Dallas County APA League Operator Lori Way said. Players from the Omega Tour also entered the tournament and some donated their winnings from the Omega tournament. 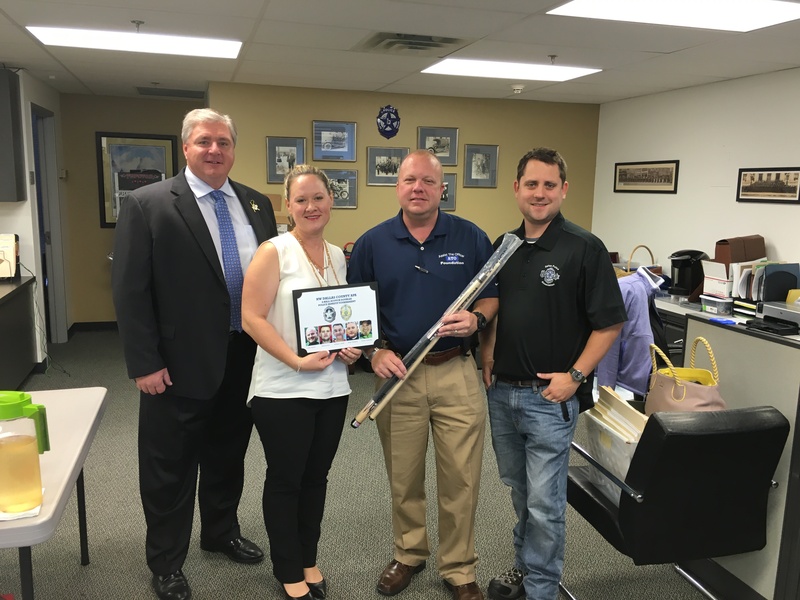 After the awards were presented to the 2nd Place team, PK Daniels donated the pool cue he won in the tournament to one of the families. PK asked Lori to find out which one of the kids of the fallen officers enjoy pool and give it to them. Lori contacted Detective Joe Stinson of the Dallas Dart Police Department and asked him to help with this request. He contacted the families and found out that the last photograph taken of Michael Krol, one of the slain officers, was that of him shooting pool. NW Dallas County APA thought it best to give it to his family; so, on Sept. 9, Detective Stinson presented it to his family when they came into town. This tournament and benefit for the families of the five slain Dallas police officers was a huge success; it was a community of poolplayers coming together to help the community heal. Between the tournament, silent auction and sale of t-shirts and hats they raised $3,140!